It was not uncommon for Germans in Galicia to leave for other parts of Easten Europe. Sometimes they remained in their new homes, sometimes they returned. Bukovina, Bessarabia, and Volhynia were the more common destinations, but other areas where Germans had settled were possibilities. Below are links to web sites dealing with many of those areas. Not included are groups such as the Germans in the Baltic areas and the Danube Swabians. 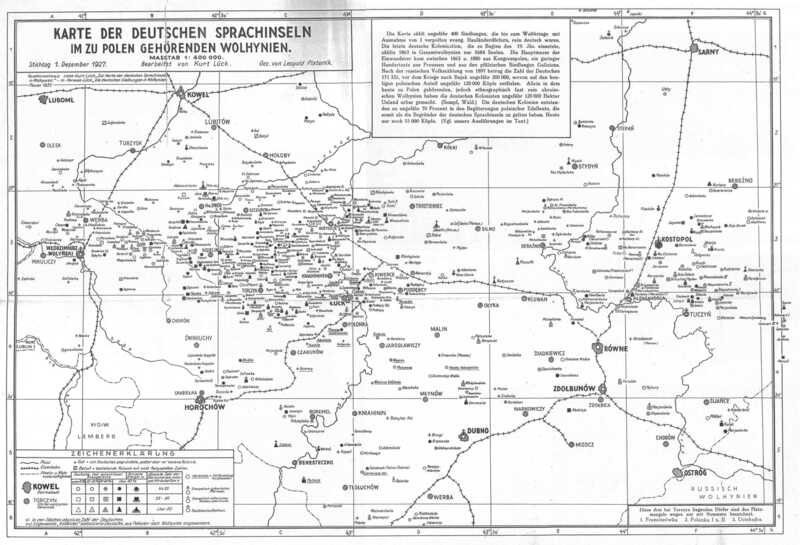 A map showing many of the German settlements in Eastern Europe and Russia is available at https://germans-from-russia-settlements.blogspot.ca/p/maps.html. Dennis Bender's searchable 195 page listing of all German settlements in Eastern Europe and Russia is available at https://sites.google.com/riehl-partner-web.de/grsl-daten/homepage. Bukovina was once a part of Galicia, but later was made a separate crown land of the Austrian Empire. The GGDS Oct., 2000 newsletter (number twenty-four) has a map showing some of the villages that had German settlers, including Katharinendorf and Alexandersdorf, two villages that had families that came from Galicia. The Bukovina Society of the Americas - In addition to the information available on the web site, there are links to other resources. The Gemeindelexikon for Bukovina - A companion volume to the Gemeindelexikon for Galicia. Bessarabia was part of the Russian Empire in the 19th century. Most of Bessarabia is now part of Moldova, but the section around Odessa is now in Ukraine, and at one time Bessarabia was a part of Romania. Records for Bessarabian Germans are found in all three countries, but the bulk of the records were held in the Lutheran archives in St. Petersburg, followed by the archives in Moldova. The St. Petersburg records can be found in the Family History Library catalog by doing a keyword search on “Konsistorium Petersburg”, which shows 135 microfilms. Also try keyword searches including the terms “Moldova”, “Romania”, "Bessarabia", "Russia", and "Lutheran" to see what other records are available. Images of the St. Petersburg records are on the FamilySearch.org web site, but access to them has been restricted. Odessa - A German-Russian Genealogical Library - This web site has a search engine for an index of the St. Petersburg records, as well as other data for Bessarabia. The index does not use standarized surnames as the Ortsfamilienbücher do, and umlaut vowels are replace with the ae, oe, and ue combinations. Scholtoi - A Bessarabian village that had settlers from Galicia. Parts of the web site are in English, but the bulk of the information is in German. This area, to the north of Galicia, was a part of the Russian Empire in the 19th century. A number of Volynian villages along the norther border of Galicia are shown on the Galicia maps that are available on the GGDS web site. Volhynia - David Obee's web site where he discusses the archive in Zhitomir/Shitomir and other sources of information. The Society for German Genealogy in Eastern Europe - Although the SGGEE concentrates on Germans in what is now Poland, it has information on Volhynia and Galicia. Some of their information is available to the general public, but much of it is for members only. One of the items available to the general public is a map showing German settlements in Eastern Europe. Look for "Jerry Frank's Map of German Settlements of the 19th Century in Eastern Europe", linked in the menu on the home page under research/villages and maps. Areas along the northern and western shores of the Black Sea were another destination for Germans from Galicia, though many of the settlers went there directly from Germany. This area overlaps southern Bessarabia, as both were part of the Russian Empire. A good starting point that has information on some of the lesser known German groups, such as the Dobrudscha. The following two areas are usually of less interest to Galician German researchers. Settled primarily by Germans coming directly from Germany. A difficult area to research, though more records are becoming available. has a great deal of information on the area referred to as Congress Poland, a part of the Russian Empire in the 19th century.